﻿ Chicago Hispanic Newspaper, Lawndale News, Hispanic Bilingual Newspapers, Su Noticiero Bilingue » Are White Lives the Only Ones That Matter? April 23, 2019 2:52 am You are here:Home Commentary Are White Lives the Only Ones That Matter? Posted by Editor on April 7, 2016 in Commentary | Comments Off on Are White Lives the Only Ones That Matter? This is to put it mildly not true, and to put it bluntly totally racist and obscene since it distorts the facts. Interestingly enough, far more whites are killed by police than Blacks. And since many police officers are white, then it means that most victims of police misconduct are whites. The point here is that a LOT of white people are committing crimes not normally reported in the news media, and that mainly white police may have had to exercise everything including the use of deadly force against other whites rather than Blacks. The statistical information takes a further twist when homicide cases are broken down. 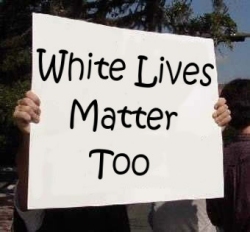 An estimated 84 percent of all white victims are killed by other whites, and 93 percent of all Black victims are killed by other Blacks. This hardly fits the profile that whites are the victims of non-whites, and it hardly fits the profile that the “white race” is endangered by non-white races. The whole “White Lives Matter” campaign was launched by the neo-nazi Aryan Renaissance Society, a Texas-based white supremacist group. Given what they are, how can they be credible? If one looks at the past, a number of European groups like the Italians, the European Jews, and the Albanians were not considered “white.” In today’s terms, all Latinos are NOT considered “white” by these extremist groups (never mind the fact that many Latinos come from countries with high rates of European immigration and ancestry such as Argentina and Uruguay). In my view, all lives should matter, and racism should have no place in law and society.